A few days ago, we conducted a survey among our clients. The survey was about cryptocurrencies and FIX API trading. Today we’d like to share the survey results with you. The purpose of the first question was to determine what the respondents thought about cryptocurrencies. 46.4% of the respondents – the largest group by far – believe that cryptocurrencies are a good vehicle for long-term investments. The second most popular answer was that cryptocurrencies are a good vehicle for short-term investments (22.6%). In my view, as is the case with the forex market, the risk associated with cryptocurrency trading increases with the duration of your orders. It is certainly true that just about all popular cryptocurrencies have experienced spectacular growth up to now and have made a lot of people wealthy. 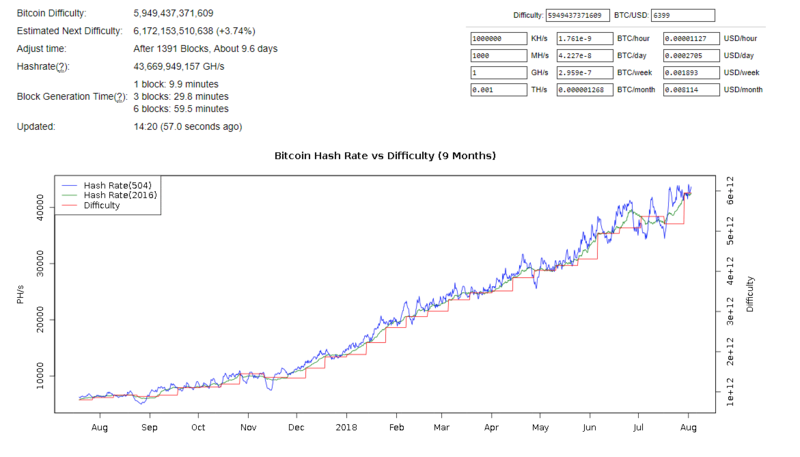 I also believe that the growth phase is not over yet: the fact that it is now more difficult to make money on the cryptocurrency market augurs well for future growth. Nevertheless, short-term trading is less risky. 17.4% of the respondents think that cryptocurrencies are a market bubble. I can’t say that I share this pessimism: blockchain technology and the decentralization offered by cryptocurrencies make cryptocurrencies an exceptionally innovative tool, which justifies the growth spurt. Watch an HBO interview with the founder of Ethereum, Vitalik Buretin. Another interview with Vitalik Buterin, this time about decentralization. 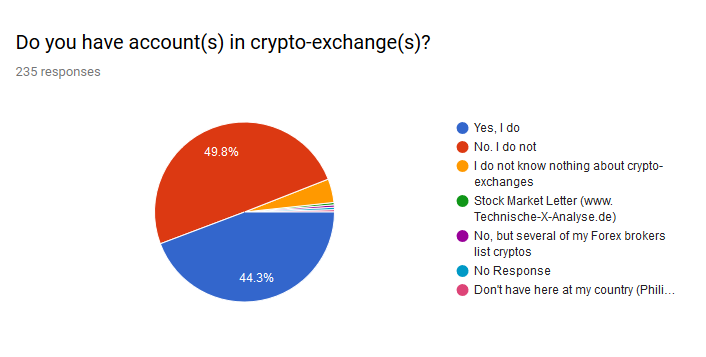 We then asked whether the respondents had accounts with any crypto exchanges. About half of all respondents appear to have an account, and half do not. It is actually very simple to open an account with a crypto exchange. Many crypto exchanges are very reliable and have been around for a long time. In fact, some crypto exchanges – exchanges such as GDAX and DSX – are even regulated (by the FCA). Our next question gauged how much the respondents knew about ICOs. The majority of the respondents are not familiar with ICOs. I recommend the following video, which introduces ICOs. Our next question dealt with cryptocurrency strategies. 74.6% of the respondents consider these reliable. We are inclined to agree with those who consider such strategies reliable. We have developed an application that allows crypto arbitrage via a socket API - Crypto Currencies Multileg Arbitrage Software; testing results have shown that this kind of trading is profitable and low-risk. 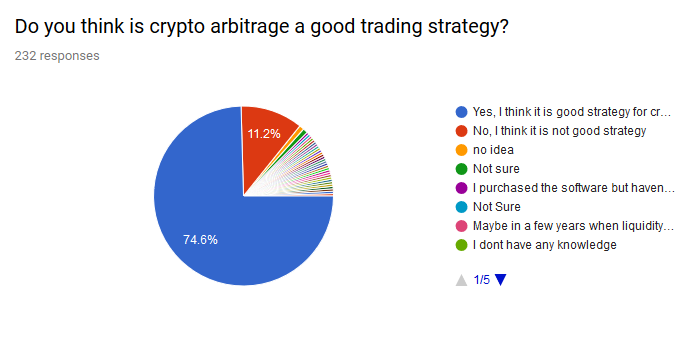 Almost half of all respondents (49.4%) are unsure of which crypto arbitrage method works best. 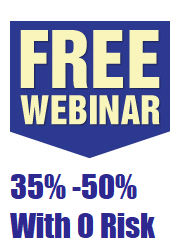 Just over 30% of the respondents believe that hedge arbitrage works best, and we agree with that. The decentralization of exchanges leads to constant discrepancies between them; however, these discrepancies might persist, sometimes for as long as several hours. A hedged position in this situation will protect your investment if the cryptocurrency price moves up or down.